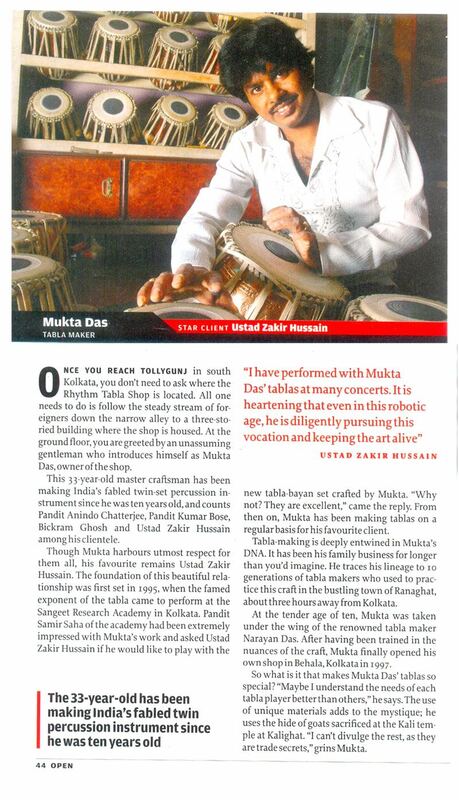 Mukta Das was born into a family lineage of 11 generations of tabla makers. His father's grandfather, the great master Surendranath Das had previously set the benchmark for manufacturing quality tabla. Mukta began his tabla making career by working in his father's shop along with his five brothers and his cousins in their home village of Ranaghat Nadiya. In 1986 Mukta moved to Kolkata to train under the great tabla maker, Nariyan Das. After fifteen years of dedicated work in Nariyan Das's tabla shop, Mukta finally opened his own shop named "Rhythm" in the Behala district of Kolkata. In 1999 he obtained a world-wide export license, and " Rhythm” flourished. A year later Mukta supplied the I.T.C Sangeet Research Academy with all new instruments and built a new and bigger shop in the Tollygunge area of south Kolkata. Mukta understands that the quality of the materials used in making a tabla is just as important as the quality of the workmanship. For this reason, he chooses camel hide straps and obtains his goat hides directly from the Kalighat temple, a famous Hindu holy site. At this point Mukta has established himself as one of India’s premier tabla makers. He supplies tablas to great tabla masters such as Pandit Kishan Maharaj, Pandit Shankar Ghosh, Pandit Swapan Chaudhuri, Ustad Zakir Hussain, Pandit Anindo Chatterjee, Pandit Kumar Bose, Pandit Samar Saha, Pandit Shures Tawalkar, and Pandit Bickram Ghosh. Mukta also provides continuous support to tabla students worldwide.